This story was updated on March 2, 2013 at 10:35 a.m. ET. CAPE CANAVERAL, Fla. — The private spaceflight company SpaceX says it has restored vital thrusters on its robotic Dragon space capsule in orbit, but the hours of last-minute scrambling to fix the problem mean the cargo ship must delay its arrival at the International Space Station. 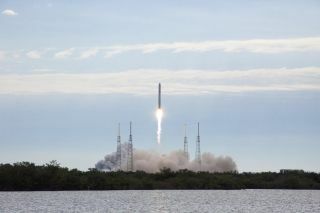 SpaceX and NASA officials say a hardware glitch, which occurred after the Dragon spacecraft's launch atop a Falcon 9 rocket early Friday (March 1), prevented the spacecraft from performing vital maneuvers to put it on course for the space station. The spacecraft is hauling nearly a ton of cargo and support equipment to the space station for NASA and was expected to arrive on Saturday. That delivery, however, is delayed for at least a day, and possibly longer, SpaceX officials said. "It's a bit too early for timing," SpaceX's billionaire founder and CEO Elon Musk told reporters in a teleconference after the launch. "We're definitely not going to rush it." The Falcon 9 rocket launched on time at 10:10 a.m. ET (1510 GMT) from Cape Canaveral Air Force Station, but once the Dragon capsule separated from the booster, the problem arose. The launch today is the second of 12 flights to the space station planned for Dragon. SpaceX was awarded a $1.6 billion contract with NASA to fund these trips. Orbital Science Corp., another private spaceflight organization, was contracted for nine supply trips to the station as well. Friday afternoon, Musk explained that after hours of troubleshooting, the four thruster pods are back online and the solar arrays are tracking, powering the capsule according to NASA officials. "There's no leakage or anything like that," Musk said. "There's no debris or fluid or gas leakage that we're aware of. All systems seem to be intact and functioning quite well that we're aware of." Musk described the problem as glitch, and not a sign of a larger problem with the Dragon spacecraft. He did say, however, that when the malfunction first occurred, "it was a little frightening there." The SpaceX team performed a series of thruster burns to move Dragon into a safer orbit around Earth. If the capsule wasn't moved, it could have fall out of orbit in a matter of days, Musk said. NASA officials seemed impressed with SpaceX's handling of the issues. The launch today is the second of 12 flights to the space station planned for Dragon. SpaceX was awarded a $1.6 billion contract with NASA to fund these trips. Orbital Science Corp., another private spaceflight organization, was contracted for eight supply trips to the station as well. With NASA's space shuttle fleet retired, the space agency is banking on SpaceX and other private companies to provide cargo flights - and eventually astronaut trips - to the space station. The Dragon capsule is carrying 1,200 pounds (544 kilograms) of scientific experiments and supplies to the space station. When the cargo's packing equipment and support structures are added, it totals nearly a ton of supplies, SpaceX officials have said. The cargo includes a set of exterior grapple bars for the station packed in the Dragon's "trunk," an unpressureized section of the capsule. Among the space haul are food for the astronauts, including fruits picked from the orchard of a SpaceX employee's father, company officials have said. The capsule is also carrying a copy of the song "Up in the Air" by the American rock band Thirty Seconds to Mars for NASA astronaut Thomas Marshburn, a flight engineer on the station. SpaceX tweeted this photo on March 1, 2013. They wrote: "SpaceX employees watch Falcon 9 & #Dragon liftoff from @SpaceX HQ in Hawthorne, California pic.twitter.com/uMGeWU32lX"
According to NASA officials, three thrusters need to be in working order before the craft can dock with the space station. Two will get the capsule within the vicinity of the orbiting science laboratory, but unless three thrusters are proved to be functioning, it cannot attach to the station. Now that all four thrusters could be in working order, it is possible that Dragon will dock with the space station as early as Sunday, Musk said. This is the first time SpaceX has experienced problems with a Dragon spacecraft in orbit, but not the first glitch on a mission by the company. During an October 2012 cargo launch to the International Space Station, one of the nine Merlin engines on the Falcon 9 rocket shut down during launch. The engine shutdown did not affect the delivery of Dragon to the station, but it did prevent the mission's secondary payload from being deployed in its proper orbit. Musk founded SpaceX in 2002 after making his fortune as the co-founder of the Internet payment service PayPal. The company's Falcon 9 rockets are named after the Millennium Falcon spaceship from "Star Wars" fame, while the Dragon capsules get their name from the song "Puff the Magic Dragon," Musk has said. You can follow SPACE.com staff writer Miriam Kramer on Twitter @mirikramer. Follow SPACE.com on Twitter @Spacedotcom. We're also on Facebook & Google+. This article was first published on SPACE.com.